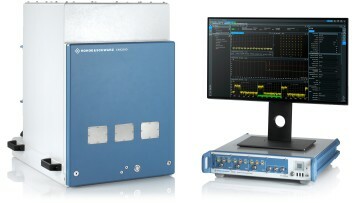 At Mobile World Congress, Rohde & Schwarz will demonstrate new solutions to reliably and efficiently test large quantities of FR1 and FR2 devices. FR2 testing is based on the new R&S CMP200 radio communication tester in combination with the new R&S CMQ200 shielding cube. The FR1 sub 6 GHz test solution is implemented with the well-known R&S CMW100 radio communication tester running new measurement software. The R&S CMP200 radio communication tester combines vector signal analyzer and ARB generator functionality. The compact one-box solution can be customized with up to three R&S CMPHEAD30 remote radio heads (RRH) for up- and downconverting signals to 5G FR2 frequencies. The separate one-box tester and RRH concept allows short RF cable lengths for an optimal link budget in radiated test environments. This approach makes it possible to test fully assembled FR2 devices and RFICs that have both IF and mmWave RF interfaces. The multiband R&S CMPHEAD30 covers all relevant 5G bands including the 28 GHz and 39 GHz ranges. The R&S CMQ200 is a compact, flexible 19" shielding solution that can accommodate most 5G devices in different applications. The drawer concept enables fully automated handling in manufacturing environments. Thanks to the robust mechanical design, the R&S CMQ200 withstands millions of test cycles. With the R&S CMP200 and R&S CMQ200, Rohde & Schwarz offers its customers a fully integrated, single-source solution that delivers reliable, reproducible results for radiated measurements. At MWC 2019, the company will also showcase its well-known R&S CMW100 radio communication tester running latest 5G analyzer and generator software personalities. In addition to 5G, the industry-leading solution supports all major cellular standards (3G, 4G) and wireless technologies (Bluetooth®, WLAN, etc. ).